Yes, indeed, there were grumblings. 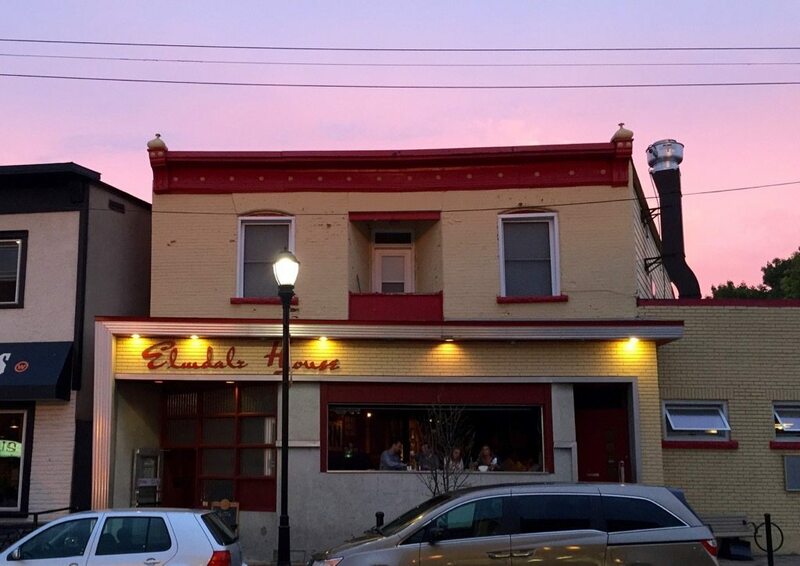 In late 2012 when news broke that The Whalesbone Oyster House group had bought the 1934 Elmdale Tavern, the bah humbugs about further gentrification of the Hintonburg neighbourhood and the muzzling of live music were loud and clear. Given the social media vitriol, you’d have thought they were tearing the place down and putting up vegan-only condos. Whereas the idea, in fact, was to honour the place; to respect its tavern past, while making some needed changes; keep the gnarly feel, but put in a kitchen where none had gone before; shuck some oysters and chuck the microwave; rebuild the bar; reposition the stage; keep the pickled eggs, but plate Ocean Wise Recommended pickerel too; offer craft beer, wines beyond ‘red or white?’, a few cocktail; fish ‘n chips, dill flecked fish chowder; plus vegetables, salads, Banana Cream Pie — you know, all that awful stuff. There’s a new garage-style rolling door with a dining ledge since my last visit. It lets in more light and summer breezes. Music still matters. Duelling Pianos on our night; something called Hip Hop Karaoke is a queue-maker they tell me. There’s ‘Shuck ’N Strut’ nights, and The Sunday Sessions (family-friendly live music on Sunday afternoons). And there’s still plenty of tattoos in this tavern. They’re just on younger arms. The passage of time is a balm, and it’s been kind to The Elmdale. 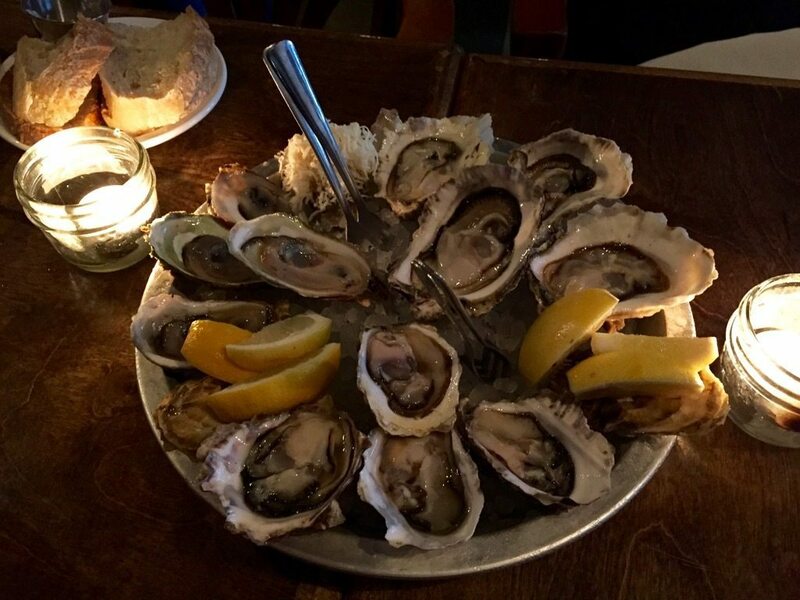 So has chief chef Michael Radford, now in charge of both oyster houses. His latest menu, newly rolled out for Spring, has a lighter feel as you might expect of a spring menu. It also has a distinct identity, separate from its big brother The Whalesbone. The menu also speaks of confidence, no longer hobbled by fear of changing things too much, too fast. What I’ve tried has been been terrific. I’d say this modern tavern has found its groove. Starting with the superlative house-made sourdough and browned butter. The spring menu is spread over a placemat page, divided into four sections. 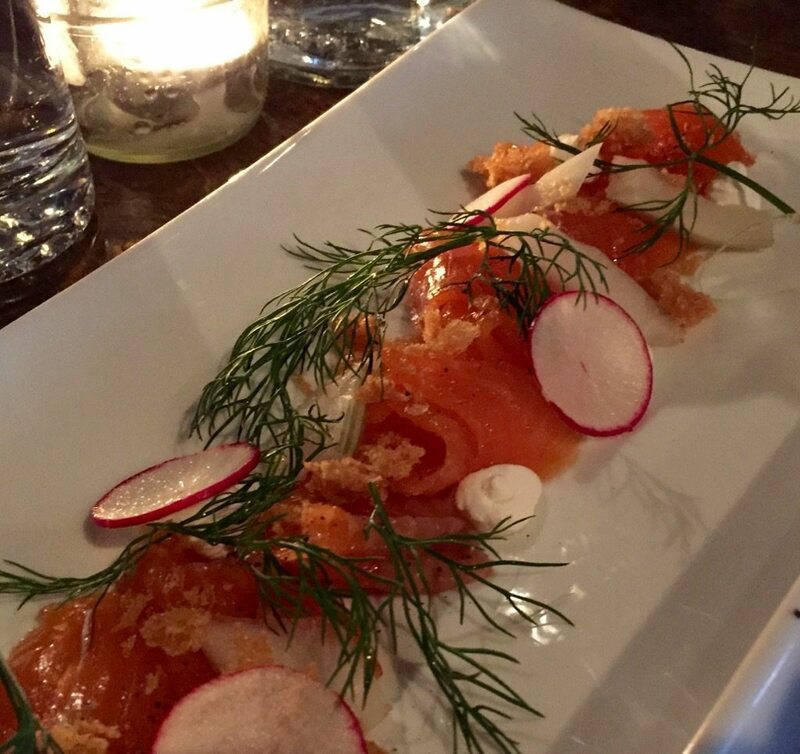 From the first (Raw/Cured/Smoked) comes oysters, ceviche, crudo, tartare, gravlax with goat cheese and fried bread, and the crunch of radish. These are all meant for sharing and unlike many dishes meant for sharing they are easily shareable. Including a Mason jar of whipped chicken mousse, light, rich and livery, served with a caramelized shallot jam and no skimping on crostini. We start with the gravlax, the mousse, a tray of pristine oysters served with a slew of condiments, and then mussels, steamed and out of their shells, paddling in a citrus-soy-sesame bath, sharpened with shallots. 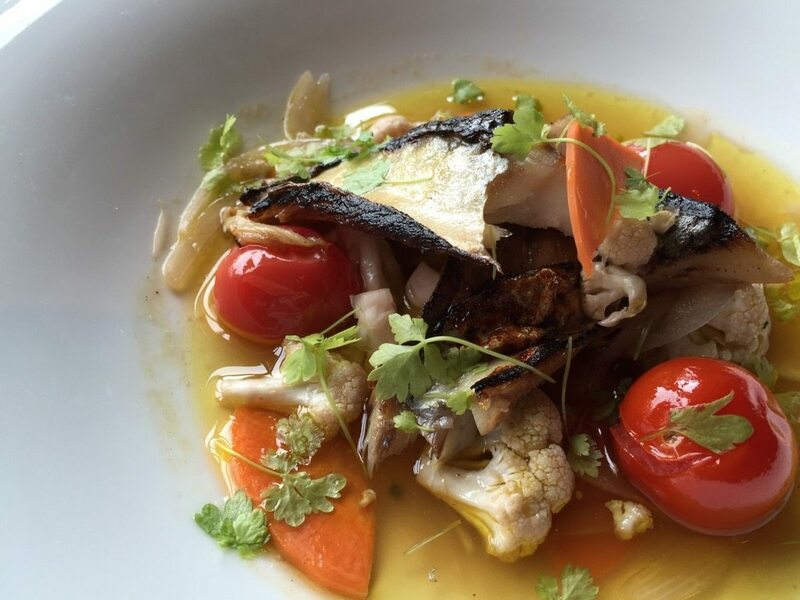 Carrots, cauliflower and cherry tomatoes share the fragrant vinegar bath where filets of seared mackerel have finished their ‘cooking’. There’s a short section called Tasty Fried Stuff — saltfish fritters, battered shrimp, and the admirable fish and chips. We share the hard-roasted Brussels sprouts, found beneath some crunchy-robed asparagus spears, perfectly cooked, scattered with a confetti of scrunchy garlic chips. A section called ‘More Food’ is where you find the more Whalesbone-like dishes. A fantastic plate of steelhead trout, crisp skinned, the flesh juicy, wobbly, plopped on top of a chewy farro salad and sided with a lovely corn sauce. A blondie with goat cheese icing caps the pleasure. Portions are on the generous side and prices, given the quality of the fish and the cooking, are fair.